The role of some officials of the municipal corporation, here has come under a cloud over the issuance of a no objection certificate (NOC) to a petrol station, whose part of land allegedly belongs to the Provincial Government, if a copy of revenue record is to be believed. The district health administration today claimed to have covered all eligible children up to the age of 5 years in the second phase of national programme for polio eradication in the district. 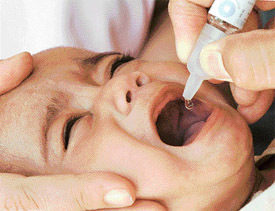 Nearly 5.26 lakh children, in the city, other towns and rural areas were given polio drops. Sarpanch Kuldeep Singh of Bardeke village accused Sub-Inspector Dharam Paul, Station House Officer, Sadar Police Station, Jagraon, for illegally confining him in the police station. 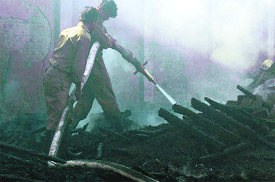 Property worth lakhs was gutted in four fires in different parts of the city in the past 24 hours. Fire broke out on a warehouse where gunny bags containing wheat were kept. Fire fighters worked for a couple of hours to douse the flames. 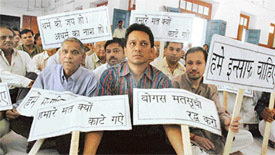 Various organisations of government teachers in this area have accused officials at local treasury office, of harassing employees of the Education Department by not releasing their salaries despite clear orders by the authorities. The treasury office officials, however, maintained that they had not received orders from the Finance Department. 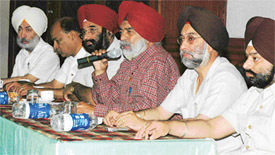 It was a unique experience for city residents and those from the adjoining towns when they were provided an opportunity to participate online in a two-hour-long medical talk show on the treatment of several incurable and crippling diseases merely through recitation of Gurbani. The newly appointed president of the District Youth Congress (DYC), Mr Dimple Rana, while sounding a note of warning to party rebels, said their conduct would be brought to the notice of party high command so that disciplinary action is taken against them. YOUTHS derive great fun by pasting funny stickers on their mobikes or painting some slogans. One such youth, however, had a cruel brush with reality of the world. He had painted a slogan NO FEAR on his number plate instead of the mandatory number. Leaders of various political and social organisations paid tributes to Shahid Gurmel Hunjhan and Joginder Singh at a function organised at Pandher Kheri village, near here, yesterday. The organisers dedicated the anniversary of the deceased to the cause of improvement of education in the state-run schools. 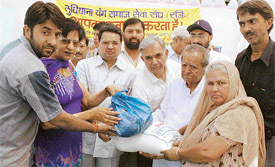 The Ludhiana Young Samaj Sewa Sangh stands apart from other organisations by doing a great service in helping the needy, destitute women and orphans. An election meeting of Shri Atmachand Jain Sabha was held at SAN Jain School this morning. Its agenda was the election scheduled to be held on May 26. But a great deal of tension prevailed at the meeting. Leaders of various social and political organisations of the town and surrounding villages paid tributes to Mr Sham Sunder Jain, a councillor and a former vice president of the local Municipal Council who died under mysterious circumstances a fortnight ago. These organisations reiterated their earlier demand to get the case probed by some investigation agency. The Lions Club International (district 321-F) will take up several service projects like AIDS awareness, blood donation, TB awareness, drive against female foeticide, environment, child care, sight first and lion quest during the current lionistic year. Resentment is brewing among the faculty members of the Dayanand Medical College and Hospital over the discriminatory attitude of the management and its failure to meet the demands of the faculty. More and more teachers now wish to be relieved for performing spot-evaluation duty as it is more lucrative as compared to the job of supervision. The university, in order to ensure the timely declaration of results, conducts examinations and spot- evaluation side by side. He is blessed with an eye that bring a new angle to nature. His fascination for nature speaks loudly through his photographs that are on display at the Sutlej Club these days. Once Indian football team were Asian champions and even reached the semifinals in the Olympics but the graph of the team’s performance during the past three decades has been declining.